Divination is the practice of foretelling future events or accessing information and knowledge via metaphysical means and tools. Throughout history there have been many methods used from the reading of salt sprinkles (alomancy), to the interpretation of flames (pyromancy). Some of the most commonly practiced methods today include: astrology, psychic reading, palmistry, psychometry, numerology, and cartomancy. Listed below are several popular methods and resources for learning more about them. Astrology is the study of a person's birth date in relation to the stars and the planetary system in order to assess their characteristics and how they relate to others. Horoscopes are a portion of this method in that they may reveal general aspects related to an individual's zodiac sign. More personalized readings are done through the use of natal charts. Astrology and Numerology Information, both basic and advanced. Linda Goodman. Linda Goodman's Love Signs. 1978. HarperPerennial. Great resource for analyzing how signs relate to each other whether in personal or professional relationships. Palmistry, or chiromancy, is the art of reading features of and lines on hands. This information provides insight to attributes of the person and their destiny. Morwyn. The Complete Book of Psychic Arts. 1999. Llewellyn. St. Paul. Includes an abbreviated palmistry manual. Psychometry is the art of holding a small object in order to obtain information about it's owner. Personal belongings such as jewelry, glasses, pens or photographs are commonly used. Many psychic detectives use this method in order to aid in police investigations. Numerology, the study of numbers, is used to derive a single digit number from a person's birth date. That number then corresponds to characteristics and destiny of that person. Onomancy is a related method where letters have representative numbers, which are then applied to the characters in a person's name, added together and interpreted. Tarot cards, fortune telling cards, angel cards, playing cards. The use of any style of card deck to obtain information about a person's past, present, or future is a form of cartomancy. Generally the practice of using such cards is also enhanced by other skills, such as clairvoyance, in order to offer the most valuable readings. Many psychics will use cards as a tool to aid them, perhaps to narrow the scope of a reading to specific concerns of the person. There are hundreds of decks from which to choose. The most important thing to take into account when selecting a deck is that you should select one that you feel drawn to or a connection with...one that the artwork is appealing to you. If you don't see one the first place you look - try another source. manual that is easy to comprehend. Includes illustrations. and common questions clients ask. Ouija Boards and Psychic Circles are just two of the types of talking boards in which a small disk (planchette) is placed on the board with the people involved touching it and asking questions. The questions are responded to as the disk moves across the board spelling out messages or indicating symbolic signs depicted on the board. Although the Ouija board has been around for years and is marketed as a 'game', these boards should be used in good intention and with caution. The Psychic Circle is a more advanced board that comes highly recommended. It is accompanied by a manual for it's use and includes purification rituals and white light visualization to be used in conjunction with the board, making it a safer tool to be used by beginners. Unlike Ouija boards, which are found in toy and game stores. The Psychic Circle may be purchased at bookstores and online bookstores. Amy Zerner and Monte Farber. The Psychic Circle. 1993. Fireside. There are many styles of psychic readings grouped together in this category: life readings, mind readings, past-life readings, mediumistic readings. In any sort of psychic reading the reader uses their skills, such as clairvoyance or telepathy, to gain information for providing guidance to the person. Many psychics incorporate the use of a tool (tarot cards, runes, etc) into their reading. 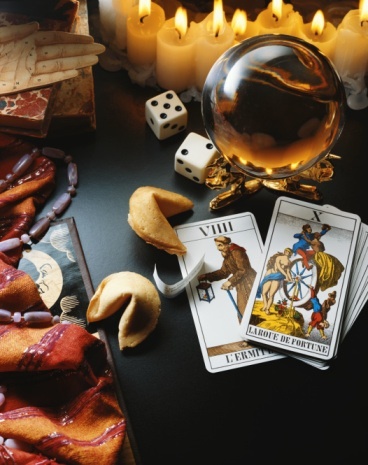 Generally, psychics will experiment with various methods of divination in order to find the ones that work best for them personally in combination with their natural abilities. Past-life readings are sometimes done through divination. More often, deep meditation, or hypnosis is used to acquire the information and this is referred to as past-life regression. It is now an accepted practice used by therapists in the treatment of phobias. Any method of divination that employs the scattering of sticks, coins, stones or similar objects is considered to be an oracle reading. The two most popular today are I Ching and Rune-casting. Both have ancient roots, Chinese and Norse/Germanic respectively. Automatic writing is a means for communicating channeled messages from the spirit plane to ours via a writer who acts as a medium. The writer's hand is guided by a spirit, oftentimes one of their guides, to write or type. Many works have been channeled with this method...articles, novels, poetry, and music. There are also paintings, drawings, sculptures and other works of art that have been produced in a similar fashion. As with all channeling, if you choose to try this method, it is important to learn and utilize grounding and protection practices beforehand. sixteen books channeled by Ms. Montgomery. Crystallomancy, one form of scrying, employs the use of a quartz crystal ball to obtain information through images. Scrying may also be accomplished with water pools, other types of crystals, and special mirrors. It is believed that the users' clairvoyant images are projected onto the surface thus making it possible for the reader to see them more clearly and to then pass along messages to the inquirer. "A gain it is to find a beautiful human soul." There are various forms of this method in which a person uses a divining rod or a pendulum. Also called dowsing, this is a means of finding water, minerals or other objects underground. Pendulum divination is a popular variation used today in which a typically metal weight or ring is attached to a chain or string and is held over a chart in order to obtain information. This is very easy method for beginners, or even for those who are just curious to try a divination method, as it doesn't require any special tools. You can make your own pendulum and directional chart (for reading the yes/no/uncertain answers) from things right at home. See the links below for further information.